I received a sample for review. All thoughts and opinions are my own. Three and a half years ago when we registered for a high chair we choose a cute plastic high chair with a fabric cover. It looked great but after each meal it looked like it needed washing. Fast forward to now. We’ve learned a few things along our journey through parenthood thus far and one is that a wood high chair is far easier to keep clean and sanitized. 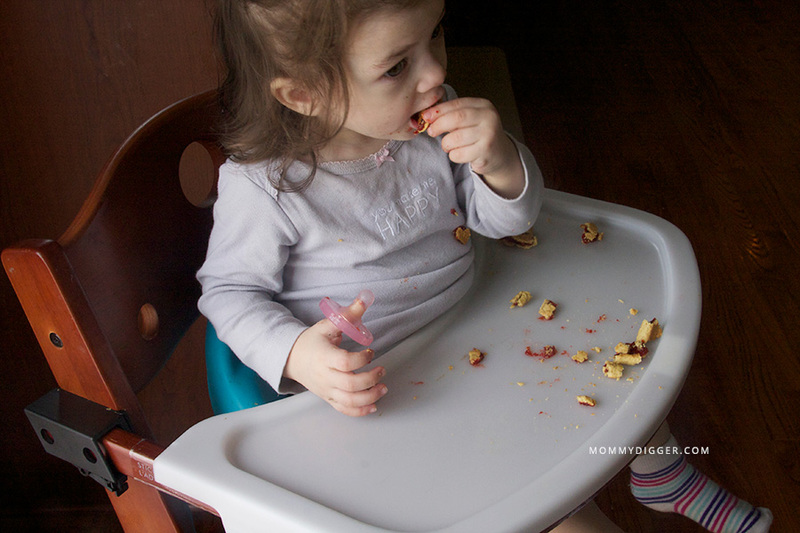 We received the Keekaroo Height Right High Chair to review and since we started using it my life has become a little easier as far as keeping the house clean goes. The Keekaroo Height Right Chair is awesome for a few reasons. First off, it looks great. It’s sleek and has a great mahogany wood finish (it also comes in a natural wood finish). It looks great in our kitchen and fits nicely into the room without taking up a ton of space. Putting it together was easy and in under a hour our chair was complete and ready for Loo Loo to sit down and enjoy a snack in it. There is an available Keekaroo Comfort Cushion for infants and toddlers, its soft and cushiony so baby is comfortable and cozy while they eat. It comes in many colors, I chose teal to accent the teal in our home. The tray is also wooden and comes with a plastic tray cover that snaps over it and stays in place. This makes cleaning up even the messiest meals easy. We’ve had many spaghetti and lasagna nights and I used to fear the high chair cleanup aftermath… but now, it’s super easy and takes a few quick wipes with a damp washcloth. The wooden parts of the chair can be cleaned with mild soap and warm water. What I also love about this high chair is that it can be used even after your children are out of the high chair stage. It can be used for as chair for children and adults up to 250lbs. It’s also height adjustable so you can adjust it to fit your table or countertop height. We have a barstool style dining table and it’s highest setting is perfect for our dining table. The 3-point safety restraints hold Loo Loo safely in the chair and prevent her from scooting or slipping down. It’s easy to clean, easy to get Loo Loo in and out of and looks great in our kitchen and dining area. We’ll have this chair for years to come AND it’s such great quality I wouldn’t be surprised if my girls will be able to use it when they have children of their own. Also, I wanted to mention that the Keekaroo Height Right Chair is made in the USA and it comes with a 5-year warranty! BUY IT: The Keekaroo Height Right High Chair and available accessories are available on the Keekaroo website and in stores – find one near you. I love how its useful after the baby grows up. I like the 3-point safety belt this high Chair is Awesome!! Although, I wouldn’t intend for it to be used by an adult, I love that it’s so versatile and can be used for years. I love that it’s transitional, It’s just what we need for our family! Thanks for the opp! i really love the overall look and quality of the chair. i feel that it is one that would look really nice at the family table and blend in as part of the set!